All weapons listed on this site are grouped into one of about 20 groupings. These groups are of my own devising, and while as accurate as I can make them, are not precisely picked up from the factory. I could be wrong. I have been in the past. Below is a simple list of all the classes. Most are self-explanatory, but if you have trouble, go to the next tab on finding your model number. Or, just peruse the long list of weapons by caliber, which has some more information, but is broken out by every variant so is very long. I am not going to cover information detailed other places, like how to find your model number, how to find the date of manufacture, and other stuff. Look at the tabs across the top for these. Parts, spares and accessory dealers are in the Information tab. The Star factory considers most guns to be in one of two categories, either "commercial" or "military." Military means government issue, really, and includes the Guardia, and all domestic police forces as well as the conventional armed forces. Domestic is the critical word here. Firearms built for issue to a government outside of Spain are still generally considered to be "commercial" models. This is why the "Miliary" Model 1921 and the "Commercial" Model B can both have been issued to government troops. To keep things simple, for myself mostly, I use these terms in the Star manner, so don't be confused. Almost all "classic" era Star pistols, basically 1911-looking guns, were made in both original and Super variants. The original series employs a Colt/Browning swinging link, while the Super series use a Sig/Petter closed cam path system. The super models were almost always sold alongside the original style pistols, and did not supplant them. They are easily identifiable, aside from markings, from the takedown lever on the right side; conventional pistols will require removing the slide lock pin entirely. The Star factory continued the traditions of Spanish arms makers in their love of the custom arm as well. There are many examples of finely engraved Star pistols, especially smaller guns as presentation pieces. The degree of customization and intricacy varies a great deal. The factory entertained true custom orders, but the best of these rarely pop up on the secondary market, and do generally command a significant price premium. Many, many guns were also made with semi-custom features, such as plated controls, special finishes or minor engraving. As Stars are not collectable, these generally bring no premium at all. If you want to start a collection, look for really nice Spanish handguns. As a general rule, "pretty" customization, such as plating, anodizing and engraving can be assumed to come from the Eibar factory. Functional modifications (enlarged slide stops, magazine floorplates) will be aftermarket. Okay, this one is covered other places, but I'll touch on it here. If a firearm was not built in your country, it was imported. In the US at least, and aside from special cases like war trophies, this was done by an importer. Importers have to stamp the gun with their identifying information. This should not be confused with the manufacturer info. Also, importers are usually very large dealers. Sometimes, special packages are made up for these dealers, of custom guns that are not necessarily cataloged otherwise. This adds a lot of confusion; a weird variant will suddenly become very common as a stockpile of some special order will appear. There are numerous methods by which a locked- or delayed-breech pistol may operate. The most common are short-recoil systems, and the most common of those are the tilting-barrel systems. Stars employed two of the three most useful and common systems of tilting the barrel. 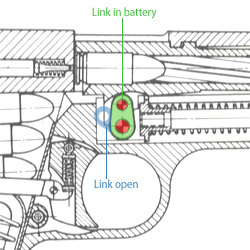 In each of the diagrams below the red dot is the stripping pin, locked to the frame, which acts as the barrel cam pivot point. The green area is the path the it takes during travel. All diagrams are shown in battery. The barrel is tied to the operating pin with a link, pivoting at the barrel end as well. 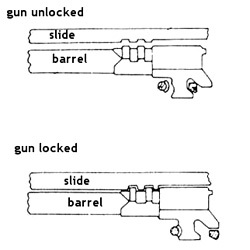 Rearward movement of the slide on firing moves the barrel which causes the link to pull the barrel down and out of engagement with the slide. The barrel stops at the loading position, while the slide continues to eject the casing and absorb remaining recoil. This is the earliest really functional system, but limits how the designer can adjust the mechanism as the path is always an arc. Best known from the Colt 1911, and therefore used on Star Models 1920 and '21, and all Classic series Star pistols. The general method of operation is identical, with the barrel tied to the slide and slowly pulled out of engagement. However, the camming mechanism is integral with the barrel (or barrel extension). A a slot is cut at an angle into the bottom of the barrel extension, which engages with surfaces machined into the side of the frame, the end of the spring guide rod, or other parts. This allows the designer some control over the speed of unlocking, without changing the height of the barrel, as is the case for the swinging link. The High Power, Smith & Wesson automatics, and most modern designs (Sig, Glock, HK) have settled on this pattern due mostly to simplicity of manufacturing, requiring only flat surfaces be cut and finished. 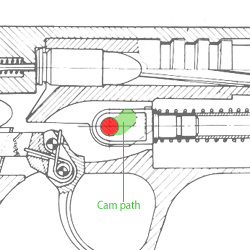 This merges the one-piece concepts of the ramp with the smooth cam action of the swinging link, and machines a cam path into the lower barrel extension. The stripping pin is inserted through the cam path, and acts as the guide pin as on the swinging link, but the path can be designed to unlock the gun at different speeds at different portions of the slide travel; this theoretically allows for a smoother action, tuned to the firearm, slide weight and caliber much more so than any other system. Devised by Charles Petter and first offered in the SACM, this is best known in the Sig 210, CZ-75 and it's ancestors, and the modern Star pistols. To see this in action, check out this animation I have created of an M30 pistol. Other variations, such as whether the lockup with the slide is via barrel rings or the barrel hood and ejector port, are fairly minor and not expressly mentioned. Design & code ©1995-2019 Steven Hoober | Many materials reproduced here are copyrighted by their respective owners | Have something to ask or share? Send me email  be sure to leave the subject line prefix or your message will be filtered out!